Recently, our team has received a number of requests asking us about the differences between analytics tools, including whose data is correct. The short answer is that it depends. Before comparing analytics platforms, it is important to note that there will be differences in how metrics are recorded and reported. Google Analytics may be the standard against which all other platforms are measured, but this is mainly due to name recognition and market share. This does not mean, however, that it is always right or that it is the only service available. Whichever solution you choose, please remember that it is only a tool and only as effective as its user. 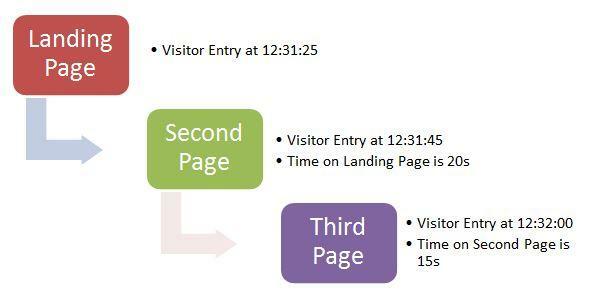 In UPTRACS, the total Time on Page for the Landing Page and the Second Page can be calculated for this scenario, and a total Time on Site for this visitor would be 35 seconds. Google Analytics also uses this method, but employs a list of ‘engagement hits’ to calculate Time on Page when there is no subsequent page view. However, what happens if none of the engagement hits is triggered? The Time on Page for that visit would be whatever Google Analytics says it is. In general, we have found that metrics in Google Analytics such as Time on Site, Time on Page, and Bounce Rate tend to be inflated when comparing them to other analytics tools. One question you should not be asking is “how does my data compare across analytics tools?” Rather, ask a series of revealing questions: “What am I trying to accomplish with my website strategy? What does the data tell me about how my strategy is performing? How is the data trending month over month in my analytics tool of choice?” Since every platform measures metrics in its own way, you need to focus not on the differences between tools, but on the trends within each tool and what they tell you about how your site is doing. It is also important not to put too much focus on one particular metric. Time on Site will tell you how long, on average, visitors were on your site, but it does not tell you why. Adding context through other metrics, such as Visits by Referral Source or Bounce Rate, will tell you what is working and what’s not. Keep in mind the differences in analytics tools, and be aware that the platforms will not always match. If you go into reporting with your eyes open, take a holistic look, and ask questions that are in line with your marketing strategy, you will get better results for your website in the long run.Want to learn more about call tracking and how easily you can set it up through UPTRACS to drive more sales at less cost to your bottom line? We're happy to arrange a no-obligation demo and conversation. Start your free trial or give us a call at 855-287-8722, we're happy to help.